Solar and Wind: How Low Can They Go? Analysts found that new solar and wind installations are cheaper than a new coal-fired power installation just about everywhere — even without subsidies. 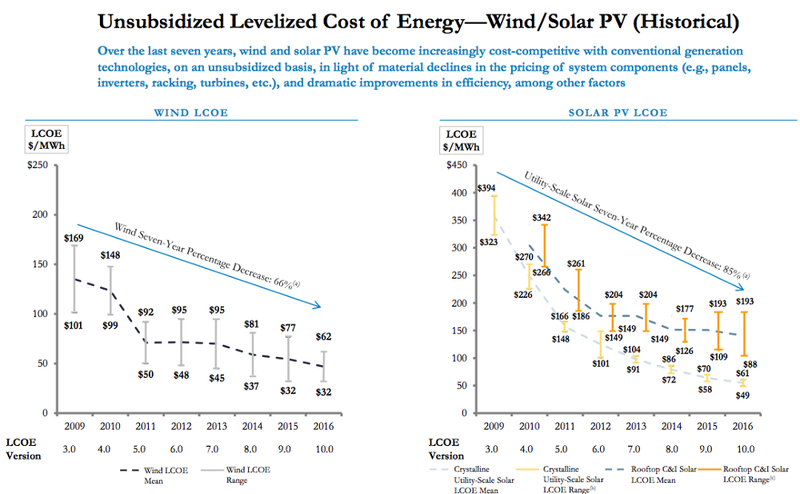 The cost of renewables continues to fall rapidly. Solar and wind are getting really, really cheap. Since just last year, the cost of utility-scale solar has dropped 10 percent, and the cost of residential solar dropped a whopping 26 percent — and that is coming after years of price declines. The cost of offshore wind declined by 22 percent since last year, though it still remains more expensive than onshore wind. The Lazard report is just the latest chapter in the success story of renewable energy. Since 2009, the cost of solar has been cut nearly in half. The cost of wind has fallen by two-thirds. The precipitous drop in price is reminiscent of shrinking costs for personal computers. Wind and, particularly solar, have yet to level off. New technologies and cheaper materials will continue to drive down costs in the years ahead. The chart below shows the total cost per megawatt-hour of different forms of power. 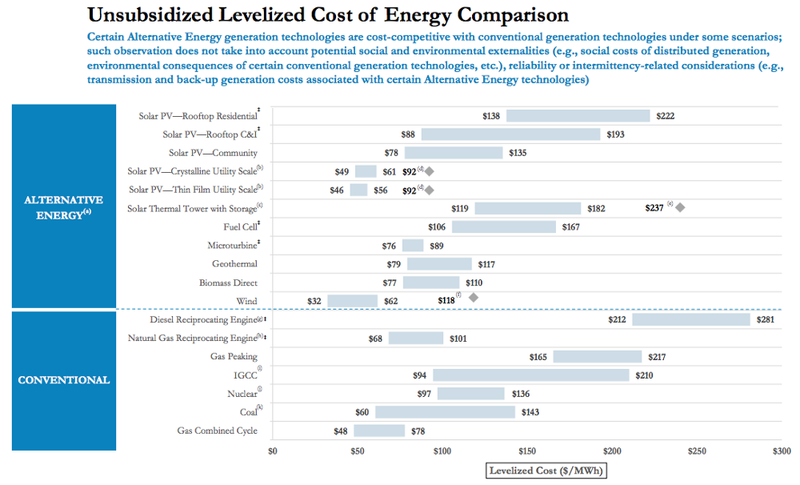 Lazard added up the lifetime cost of parts, fuel, labor, and other expenses and divided by the number of megawatt-hours generated. From this, they produced a range for the levelized cost of energy (LCOE). This figure does not include energy subsidies nor the cost of environmental impacts. For instance, if a solar panel costs $100 without subsidies and $70 with subsidies, the LCOE would still be $100. On the other hand, if a gas turbine costs $100 without accounting for the social cost of carbon, and $130 after accounting for the social cost of carbon, then the LCOE stays at $100. By and large, wind and solar are going up in locales with an abundance of wind and sunshine. Wind is most cost-effective in the windswept states in the middle of the country — such as Iowa, Oklahoma, Kansas, and Texas. Solar is most cost-effective in the sun-drenched Southwest — states like Nevada, Arizona, and California. Natural gas is still the cheapest option in much of the rest of the country — but keep in mind that the levelized cost does not account for the environmental cost of burning fossil fuels. A new tool from the Energy Institute of the University of Texas shows the cheapest kind of new power plant by county, accounting for land available to deploy a particular technology. 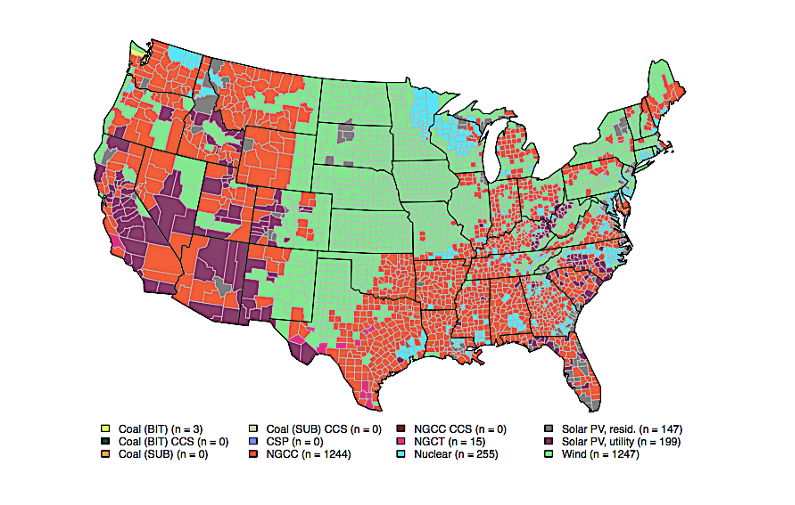 (For instance, the site notes, “it is not likely that one could build a power plant in a national park.”) The map below shows which technologies are most cost-effective without subsidies. 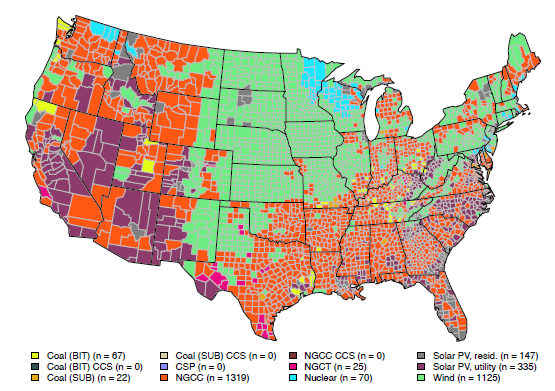 It’s clear why solar, wind, and natural gas are taking over the country. In light of these trends, some may be asking why we need subsidies at all. Subsidies account for the costs of air pollution and climate change. Given the pace of technological progress, it would be fair to ponder whether, left to its own devices, the market would take care of climate change. Low-emissions natural gas is rapidly displacing coal. Solar, wind and battery storage are getting cheaper every day. The power grid is decarbonizing itself, right? The problem is that averting dangerous climate change demands the rapid transformation of our energy system. That means we can’t just build new, low-carbon power plants at the rate of replacement. We also have to shutter existing carbon-intensive power plants. Thus, while natural gas may offer an attractive way to curb emissions in the short-term, a gas-fired plant built today may need to be closed before the end of its operating life if we are to meet our emissions goals. One remedy is to account for the cost of climate change — make polluters pay for polluting, or offer tax breaks for renewables. These policies can help expedite the transition to clean energy by making zero-carbon power more cost-competitive. 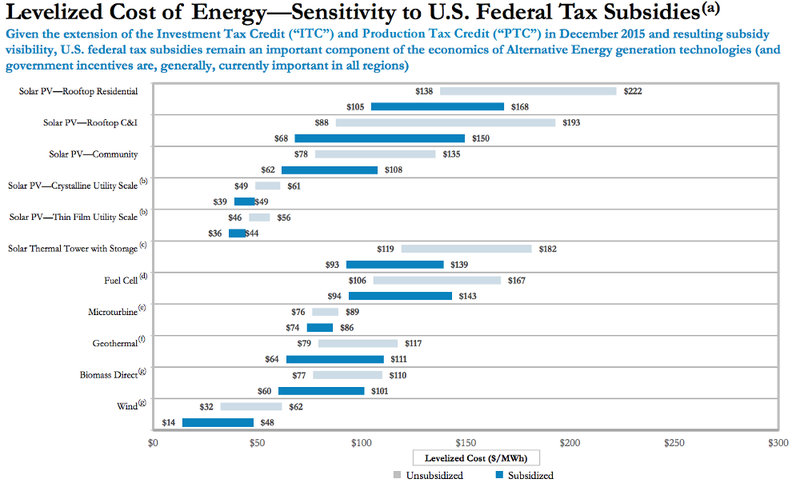 The chart below shows how federal tax credits impact the cost of renewables. The effect is modest, but it is important in helping wind and solar compete with coal and gas in much of the United States. Fossil fuels, it should be said, have benefitted from decades of federal support. If you applied a modest fee to carbon pollution — rather than a tax credit for clean energy — that would discourage the construction of new coal- and gas-fired power plants. Wind, solar and nuclear would become the cheapest kind of new power plant across a broader swath of the country, as shown in the map below. The cost of power, of course, is only half the battle. There is also the matter of intermittency — the fact that wind and solar only generate power when the wind is blowing or the sun is shining. Energy storage. Solar panels frequently churn out surplus power during the middle of the day. That surplus power can be stored, for example, in a lithium-ion battery and used later. As the Lazard reports notes, storage costs are dropping fast. A national power grid that can carry surplus electricity generated in one part of the country to power-hungry cities in other parts of the country. Nuclear power. Nuclear power can provide a baseline level of electricity, but as the Lazard report shows, nuclear remains too costly to be practical in much of the country. However, scientists are developing new kinds of reactors that could prove cheaper and more efficient than today’s nuclear plants. Improved infrastructure (a possibility) and cheaper energy storage (an inevitability) will make wind and solar more attractive. As costs continue to fall, expect another banner year for renewables in 2017.